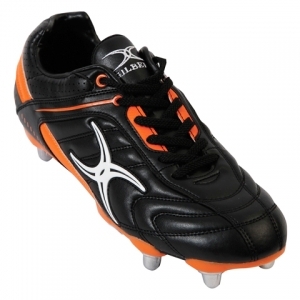 As worn by the professionals...the Junior Sidestep Barbarian from Gilbert is an updated version of a classic. Ideal for younger players looking for comfort, stability and durability, the Sidestep Barbarian features synthetic uppers, a preformed removable footbed, and a low cut soft toe. A 6-stud configuration is designed for optimum traction on softer ground. Classic styling in the Sidestep is based on Gilbert’s senior boots for professional players.